Heat broth, beer and lentils to boiling in 2-quart saucepan; reduce heat. Cover and simmer 20 to 25 minutes, stirring occasionally, until lentils are tender but not mushy. Stir in remaining ingredients except cheese. Heat to boiling; reduce heat. Cover and simmer 20 minutes, stirring occasionally. Remove bay leaf. Sprinkle each serving with cheese. For a slightly thicker broth, blend 1 cup of the soup in blender and pour back into the pan. Leftover soup? No problem! Refrigerate it and serve again tomorrow. 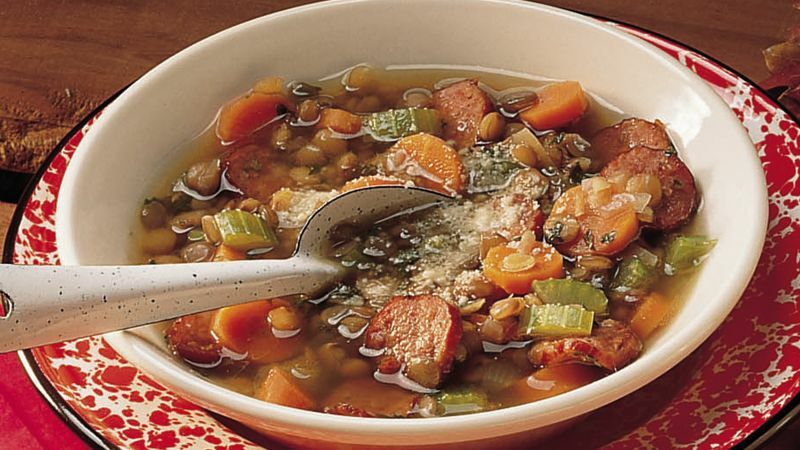 The flavors will have time to blend, and the soup will taste even better!